Since 90 per cent of Kauai is inaccessible by road, hiking is a great way to experience the island's celebrated natural bounty. There are a number of good hiking trails around the island, but by far the most famous, and the most popular, is the strenuous 11 mile (about 18km) Kalalau trail, which winds along the Na Pali Coast. This spectacular coastline is dotted with waterfalls and swift-flowing streams, which over centuries, have cut steep, narrow valleys, that terminate in rugged cliffs overhanging the ocean. The trail begins at the end of the road at Kee Beach, and most hikers will opt to camp out for at least one night before returning. 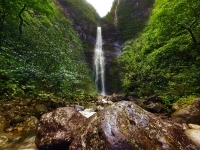 It is possible only to hike the first two miles (about 3km) of the trail, which will lead hikers to Hanakapiai Beach, where they'll be greeted by breathtaking views of Kauai's North Shore. Note that the Kalalau trail will take even well-conditioned hikers a full day to complete, and should not be undertaken lightly; however, those who are willing to put in the effort, will be richly rewarded. Permits are required when continuing beyond Hanakapi'ai Valley (two miles into the trail), whether you are planning to camp overnight or not, and can be obtained from the State Parks office in Lihue during normal business hours. Opening times: The number of people allowed on the trail at any one time is limited. Permits often sell out, and during busy times can sell out up to a year in advance. Book early to avoid disappointment. Admission: Permits are $20 per person per day.